From Bud to Boss, outlines practical steps new supervisors can take to face the challenges of leadership with confidence. Each section offers a chance for self-assessment and goal setting, so readers can identify their own areas for growth. As readers reflect and then act on the principles in the book, they will become more effective in their leadership roles. 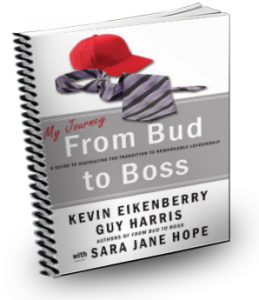 A companion volume to the From Bud to Boss book, and a great companion to follow your attendance in one of our workshops, the Journey is a workbook designed to help you apply the knowledge gained to actual work experiences. Each section covers a separate topic and each one is independent of the others. You can work through all of them from front to back or work through only those topics you feel will help you to enhance your supervisory skills. It includes activities, questions, and exercises designed to take you beyond the concepts introduced to you during the Workshop or the book. And while this book is completely designed to be written in, many of the tools and templates may work better in digital form, and you might want to use them more than once. We took that into account too – and every book purchase includes special access to many templates and tools in both pdf and Word document form so that you can use them over and over. In each section you will find Now Steps. These are specific actions you can take to help you through a particular leadership situation or to help you answer a specific question you might have. Some are reflective and some are designed for immediate use by you and/or your team, but all are meant to be used. You will also find Next Steps. Next Steps close each Section and give you longer term thoughts on your development as a leader in this area of your role and responsibilities. 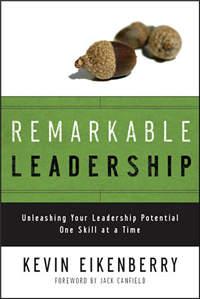 Remarkable Leadership is a practical handbook written for anyone who wants to hone the skills needed to become a remarkable leader. This book outlines a framework and a mechanism for both learning new things and applying current knowledge in a thoughtful and practical way. It provides a guide through the most important leadership competencies, offers a proven method for learning leadership skills, and shows approaches for applying these skills in today’s multitasking and overloaded world of work. The book explores real-world concerns such as focus, limited time, incremental improvement, and how we learn. The overarching, thirteenth competency – the Remarkable Leader learns continuously – is incorporated throughout the book. Beyond the content in the book, over 50 additional tools and reports are available to book owners to download to support their ongoing leadership development. We are all given a unique set of talents when we are born and it is our job to tap into our personal skills and abilities to maximize our potential throughout our lives. While our natural talents help us on our journey to become an effective leader, other skills need to be nurtured and developed. #LEADERSHIPtweet is a small, practical handbook written for anyone who wants to hone the skills they need to become a remarkable leader. This book outlines a framework and a mechanism for both learning new things and applying current knowledge in a thoughtful and practical way. It provides a guide through the most important leadership competencies, offers a proven method for learning leadership skills, and shows approaches for applying these skills. The book explores real-world concerns such as focus, limited time, incremental improvement, and how we learn. Readers will be challenged by the ideas inside — not because all of them are new, but because the book will encourage them to put what they know into action. It is also intended to be a resource to come back to as a reminder of best practices.